We’d love your help. Let us know what’s wrong with this preview of To Be Continued by S.M. James. Brought up in the 'live for likes' culture, Digi Lynch has amassed an impressive following. His channel is taking off, and Webcon always delivers a boost in numbers, thanks to his rivalry with ex-vlogging partner, Gram Saito. Gram is popular, confident, and rising to Welcome to Webcon. Where the biggest and brightest internet celebrities come face to face with their fans. Digi can't turn a corner for fear of being pranked and his reaction blasted online. And after one of Gram's most high scale pranks yet, Digi decides it's time to get even. To ask other readers questions about To Be Continued, please sign up. From that review:To Be Continued (#lovehim #3.5) by S.M. James is the last of the available stories in this author's must read YA series, a fact that's making me sigh already. That it's ending here, on the "first half" of Digi and Gram's story? Worse because this is not one of those happy stories. It's full of pain, the punch in the gut ways only family and those we care for but have blinders on can deal blows. It's being young and trying to figure things out. It's real, sometimes mean and in every way authentic as S.M James gets under these characters skins and emotions like no other. 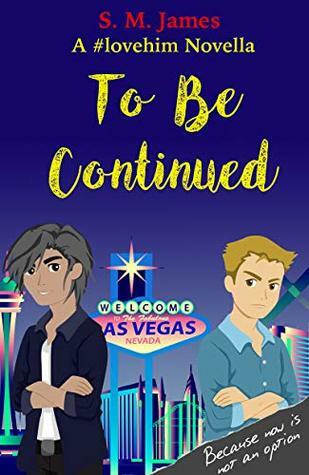 To Be Continued is a YA contemporary short novella that works as a prequel, showing the reader what has happened between Digi and Gram prior to Not Gonna Lie. These two teens are living in a world where their lives are captured and shared with the public. Where getting more fans, likes and followers sometimes pollutes your senses on what's real and you find yourself not always being the true you and having no one you can really trust. And then losing it all when it all goes too far. I really enj To Be Continued is a YA contemporary short novella that works as a prequel, showing the reader what has happened between Digi and Gram prior to Not Gonna Lie. These two teens are living in a world where their lives are captured and shared with the public. Where getting more fans, likes and followers sometimes pollutes your senses on what's real and you find yourself not always being the true you and having no one you can really trust. And then losing it all when it all goes too far. I really enjoyed this glimpse into a part of their world and can not wait to see the continuation in the next book.